In a previous role, I was responsible for planning the Professional Development program for a school district. Part of my job was to plan the yearly professional development for approximately 350 instructional staff members. It was during this experience that I truly understood the burden of professional development. As one person in charge of the learning goals for so many, it was nearly impossible to do it right. This is just the tip of the iceberg when you try to ensure that everyone is getting exactly what they need in terms of professional development. For this reason, planning professional development often becomes a burden to the lone administrator or couple of administrators who are responsible for it. It is much easier to plan a single, broad topic that applies to all staff members than to plan a personalized, multi-tiered approach to professional learning. The logistics are just plain simple. 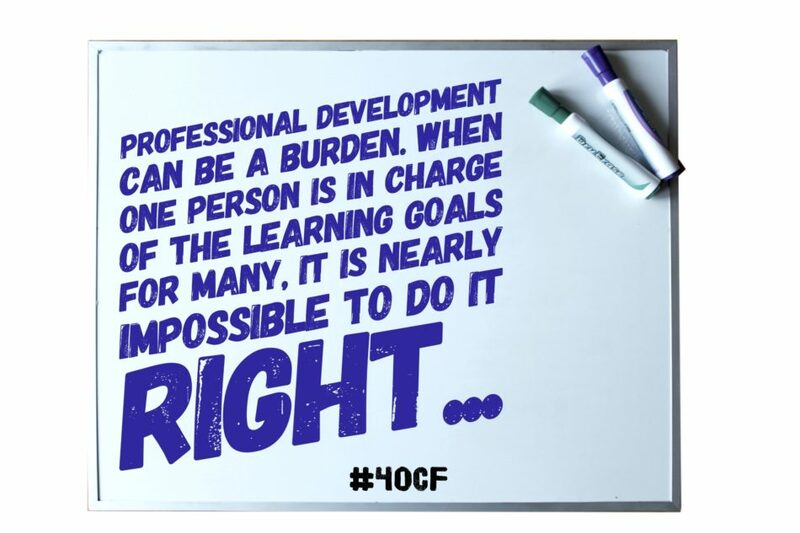 The burden of professional development should not fall on just a few people. It is the responsibility of every educator to make sure that they continue to grow as a professional. Each of us needs to take charge of our own professional learning. It’s time to go out and get exactly what you need in order to overcome the burden of professional development.